A group of mechanical engineers together with the Dutch Erasmus MC (Erasmus University Hospital Rotterdam, the Netherlands) developed the HandshoeMouse specifically to reduce complaints and risk of Repetitive Strain Injury (RSI). Some symptoms of RSI are excessive muscle tension in the neck, shoulders, arms and hands. I saw this mouse at Macworld Expo and was intrigued? surprised? bewildered? Perhaps all of the above. My first thought was, “but it is so big.” Then I tried it. That is one of the beauties of being at Macworld Expo: You get hands-on experience with products. The first thing you notice is that you don’t hold on to, or grip, the mouse. Your hand, thumb and fingers are supported in a relaxed position. There is no friction between the skin of your hand and desktop because your hand never touches the desktop. No more “skinned” hands. I was asked to hold my hands out and compare the two middle fingers of each one. The fingers on the hand that I mouse with are bigger than those on the other hand, particularly the knuckles. 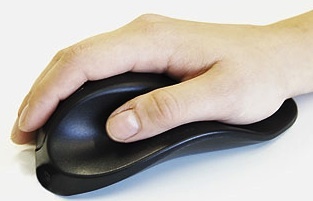 It was explained to me that this comes from holding those fingers above a regular style mouse, waiting to click buttons. Over a long period of time the fingers begin to show damage from this repetitive activity. For the HandGloveMouse to work properly the user needs to be able to rest the arm comfortably on a desk or chair arm and then rest the hand on the mouse. The mouse then moves without any effort. If you allow for sufficient space for the mouse to maneuver, you never have to lift it at all. I was warned that it might take a while to get used to the feel of this mouse, but for me that was not the case. It has such a natural fit for my hand that there was no adjustment period. I did have to rearrange my desk a bit to allow for more room for the mouse to maneuver; a small price to pay in exchange for not having to pick up the mouse to reposition it. Since I started using it, I have not had any hand cramps after spending long periods of time at my computer. The HandGloveMouse is comfortable and easy to use. It comes in three sizes and offers models for both right and left handed users. When used properly it helps reduce complaints or risk of Repetitive Strain Injury. Although it requires a larger than usual mouse work area, that is easily outweighed by the comfort and potential long-term benefits of use. Speaking from personal experience, it is great pleasure to get up from my computer without the discomfort of hand cramps. 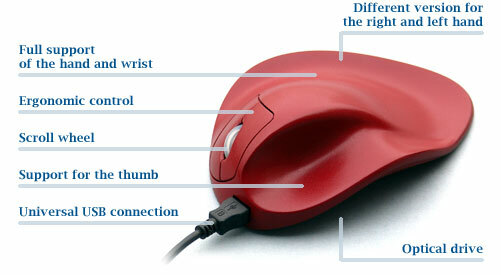 Comfortable, easy to use mouse that helps reduce the complaints and risks of Repetitive Strain Injury. Comes in small, medium, and large, and in a right and left handed option. Larger than a standard computer mouse.